Jon Jones became the first man to finish Daniel Cormier at last night’s UFC 214 event in Anaheim, reclaiming his UFC light heavyweight title in the process. Jones and Cormier went back and forth during the opening two rounds of their highly anticipated UFC 214 main event scrap, with many fans and analysts scoring the fight 19-19 heading into round three. Unfortunately for Cormier fans, Jones was able to land a viscous head kick on “DC” early on in round-three that had the champion in a world of trouble. “Bones” would proceed to take Cormier down to the octagon canvas where he began unleashing some brutal ground and pound which forced the referee to step in and call the contest. In his post-fight interview, the newly crowned UFC light heavyweight champion, Jon Jones, proceeded to callout former UFC heavyweight champion Brock Lesnar. Shortly after that, “The Beast” Brock Lesnar would respond to Jon Jones callout with the following warning. While a proposed super-fight between Jon Jones and Brock Lesnar left some fans screaming at their TV’s “take my money”, former UFC light heavyweight title challenger Alexander Gustafsson was not at all impressed with the idea. “The Mauler” quickly took to Twitter where he issued the following message to Jon Jones. 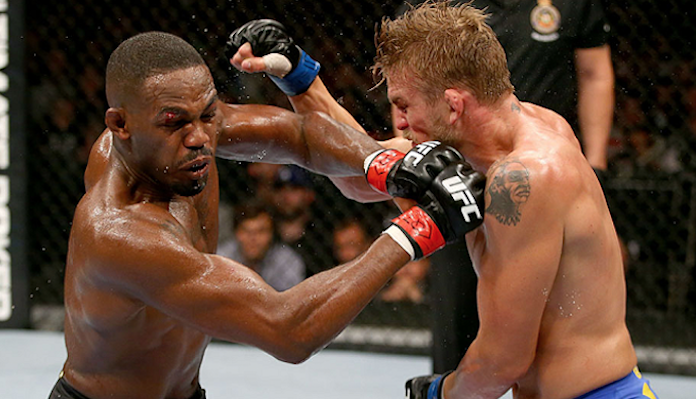 Jon Jones and Alexander Gustafsson previously met in the octagon at UFC 165 in September of 2013 and ended up delivering a “fight of the year” performance. After five rounds of back and forth action Jon Jones was awarded the unanimous decision victory over Gustafsson by the judges in attendance. Who would you rather see Jon Jones fight in his next octagon appearance, Brock Lesnar or Alexander Gustafsson? Just weeks removed from his big win over Jan Blachowicz, Swedish light heavyweight Alexander Gustafsson has another big fight in the pipe. While his last fight occurred on European soil, however, this one will take him across the world to Sao Paolo, Brazil. The two-time light heavyweight title challenger is now scheduled to take on Brazil’s Antonio Rogerio Nogueira on November 19. The bout will serve as the main event for UFC Fight Night 100. This news comes from reliable Brazilian outlet Globo. Prior to his defeat of Blachowicz, Gustafsson was neck-deep in a two-fight losing streak. The first of these losses saw him come up short against Anthony “Rumble” Johnson in front of tens of thousands of Swedish fans. The second saw him lose a tooth-and-nail title fight with Daniel Cormier, the outcome of which is still debated to this day. Nogeuira was last seen in May when he pummelled wrestling specialist Patrick Cummins to a first-round TKO. Just like Gustafsson, Nogueira’s most recent win was proceeded by two back-to-back losses: a knockout loss to Anthony “Rumble” Johnson, and a back-and-forth decision loss opposite Mauricio “Shogun” Rua. Should the 40-year-old Nogueira win this bout, it’ll be one of the finest victories of his long career. That said, he’ll likely remain some distance from a title shot, even in victory. Gustafsson, on the other hand, is never far from a shot at gold. Should he beat Nogeuira in Sao Paolo, he’ll find himself right in thick of things amidst light heavyweight monsters like Cormier, Rumble and troubled former champion Jon Jones.